Newlyn without a fish chef is like Dublin without a publican. It just ain’t right. It has been that way for overly long, but now, thankfully, Ben Tunnicliffe is at The Tolcarne Inn. Ben is a lifelong chef, an unswerving specialist. He studied at Bournemouth college in the late 80s, which he believes was then, and still is, one of the best places to learn to be a chef. As part of his course, he worked with Grand Chef Michel Trama is his lauded 2 Michelin star restaurant in south west France. This early exposure to the kitchen of such a heavyweight chef gave Ben a serious grounding in the classics and an appreciation of the very highest levels of culinary skill and dedication to craft. Once qualified, Ben cut his teeth in various country house hotels before going to work with his biggest food inspiration, chef Colin White at Woolley Grange in Bradford-on-Avon. This, Ben maintains, is where he really learnt to cook. 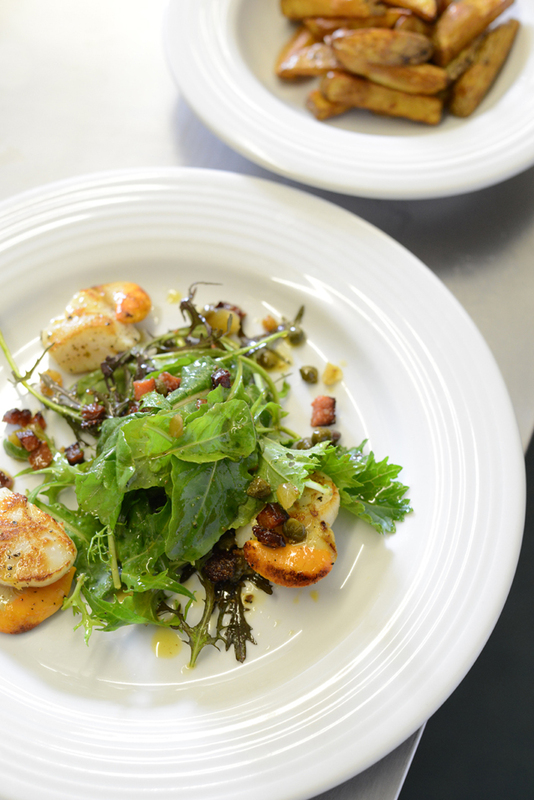 Woolley Grange has a two acre walled garden with two full-time gardeners and, for most of the year, the chefs would start in the garden, see what was ready to be harvested and plan the menu from there. An understanding of seasonality and a connection to growing has always been there for him – he grew up with his grandparents earnestly tending fruit and veg in a big plot at home, growing organically as a matter of course. The siren call of Cornwall came when friend Grant Nethercott, chef owner of Alba in St Ives alerted Ben to an opportunity at Jean Shrimpton’s Abbey Hotel in Penzance. Jean and her husband Michael wanted to put the former Zero Club space to use and create a restaurant that would compliment the charming boutique accommodation that the Abbey offers Penzance’s well-heeled visitors. Ben and his wife met with the hoteliers and a plan formed. Working together to renovate the space, they opened as the Abbey restaurant in 2001, with Ben buying the lease in 2005 and working there until selling up in 2008. They set the Abbey up with a simple ethos inspired by his Catholic upbringing – to do unto others as you would have done to yourself. To translate that into cooking, he makes food that he wants to eat. The Abbey was an incredible eight year adventure for Ben; his own restaurant, the move to Cornwall, the birth of his two sons and then, in 2003, a Michelin star. Of course, being recognised as excellent in any line of work is cause for celebration, euphoria even, but in the case of Michelin stars and the pressure that comes with maintaining them, it can be tough love. 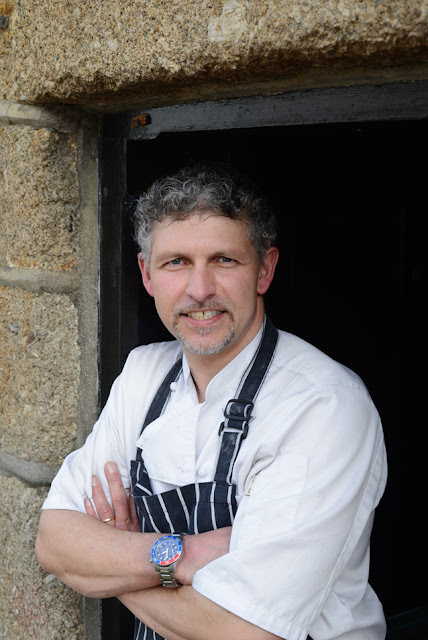 After selling the Abbey in 2008 Ben took the role as a consultant and head chef at the Scarlet Hotel, Newquay’s wonderful, luxury eco retreat brought to us by the three sisters who own and run the Bedruthen Steps Hotel. Being a fundamental part of something so brave and positive for Cornwall was a galvanising experience, but once a chef has had his own restaurant it is difficult to go back to employment, and so once the Scarlet was up and running, Ben started to think about the next door he could put his name over. The Tolcarne Inn came up for sale at the right time for Ben; it was exactly what he wanted. 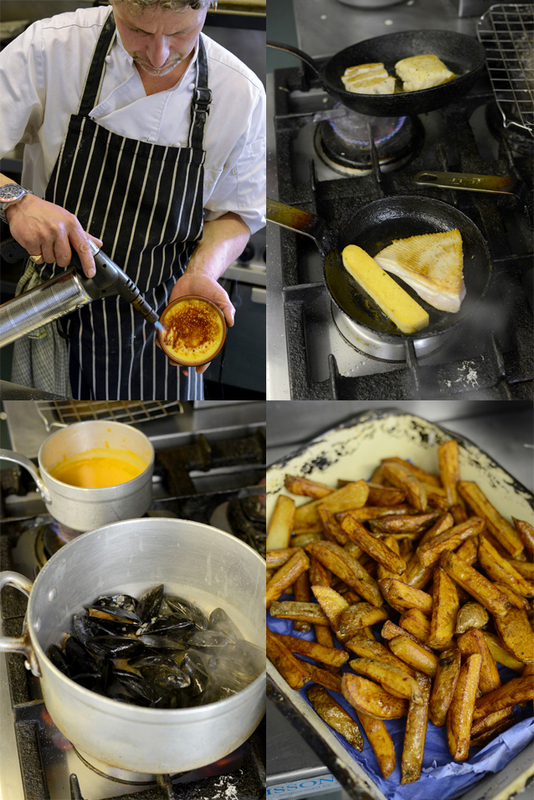 A pub rather than a restaurant and, more, a pub in Newlyn – the ultimate source for his fine fish dishes. By this time, he was tiring of the ceremony that so often accompanies fine dining. He had never set out to be a Michelin starred chef, and wanted to do something more wholesome. According to Michelin, the five criteria they judge on are quality of ingredients, skill in their preparation and the combination of flavours, level of creativity, value for money and consistency of culinary standards. The first of those criteria doesn't mean the ingredients have to be luxurious, but they do have to be very fresh. However, because of the modern media-inspired fascination with food and chefs, especially Michelin starred chefs, there are understandable misconceptions that Michelin food has to be expensive, exclusive and over-engineered. At the Abbey, this misconception clashed with the truth of Ben’s food – which is affordable, accessible and honest. His food philosophy is actually very simple: buy the very freshest ingredients you can, show the ingredient the love and respect it has received through the process of growing it, rearing it or catching it, and put something on the plate that tastes great. That is what won him his star at the Abbey, and that is what he continues to do at the Tolcarne. 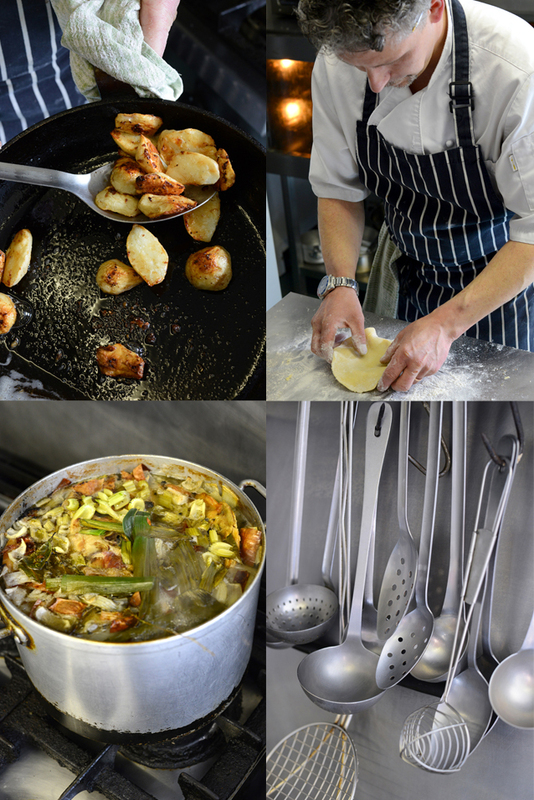 He wants to bring the same high standards to Newlyn without bringing the formality that is synonymous with it. He is out to prove that you can have great food at an affordable price. He appreciates the value of and attraction to chefs with a science bias such as Blumenthal and Adria, but he says that he is someone who doesn't want to understand how or why things work. Instinct is his ally. “Touchy, feely, tasty” is his mantra. Being in Newlyn has led to an outright devotion to fish on his menus. In Ben’s previous kitchens, the ratio of fish to meat was roughly 50:50. At the Tolcarne, it is 90:10 in favour of fish. He sees fish as an ever changing bounty, dependent on weather and which boats are working. A good relationship with Stevenson ensures that Ben knows what has been landed and when, and he buys based on the reality of the catch rather than a preconceived idea of what he wants to work with. He wants to do everything he can to help promote Newlyn and the fishing industry in a positive light, and spends study days with students at Penwith College developing recipes for students to produce in conjunction with Stevenson and sell through their shops. It’s about connecting new culinary talent to the primary produce of the area – there's nothing more sustainable than that. Beyond fish, his suppliers are predominantly local: Trevelyan Farm shop, Heather Lane Nurseries, and for the meat dishes on the menu, Vivien Olds of St. Just. He likes to buy food from people who are fundamental to its production as opposed to purveyors or wholesalers who simply make a profit on someone else's output. Of course, there would be unavoidable limitations if Ben only sourced his ingredients locally, he couldn’t, for example, seduce us with rich chocolate or the deeply floral aroma of vanilla. If you have ever had one of Ben's desserts, you will know that this would be a tragedy. At the Tolcarne, Ben is in business with his mum, Anne, who looks after front of house and beams with pride every time someone says anything about how good Ben’s food is. 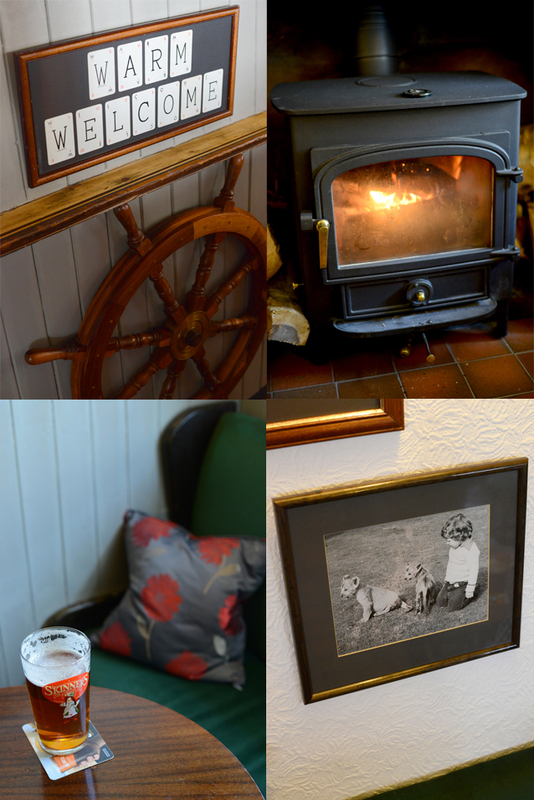 So, is the Tolcarne, a family run pub with polish that serves the best of what's landed in Newlyn every day at an accessible price point, an asset to the area? The answer has to be yes. Since moving here in 2000, Ben has worked tirelessly to bring his brand of honest yet acclaimed food to the counties full timers and visitors alike. Greg Wallace, MasterChef judge and renowned foodie, was in Newlyn the other day, stumbled upon the Tolcarne and tweeted about its tastiness. This of course is good for business, but it also strengthens Cornwall’s position as a top UK food destination. And we are talking about an ambitious soul here, so the Tolcarne may only be the first of Ben’s ventures into making our local area a bona fide food destination. In a large pan bring all the ingredients other than the skate to the boil and then simmer for 20 minutes. Add the skate to the liquor and simmer for five more minutes. Remove the pan from the heat and leave the skate in the liquid until it has cooled down though still warm. Soak the saffron in 2 tbsp of boiling water for 5 minutes. Sweat the garlic in some of the extra virgin olive oil to cook out its harshness. Mix everything together with the saffron and its water. Season with salt and pepper and more sugar to taste. To serve, flake the skate over rocket and watercress and spoon the dressing over. This article about Ben has made me want to hop in my car and drive 6 hrs to the Tolcarne right now! I'm looking forward to an hearty fishy meal when I'm next down, reserve me a space! Your blog is a real pleasure. Thank you for the time you take.